Edition: Based on dates of publisher Pendleton, active in New York 1832–1833, the Library of Congress dates printing as late as 1832–1833. 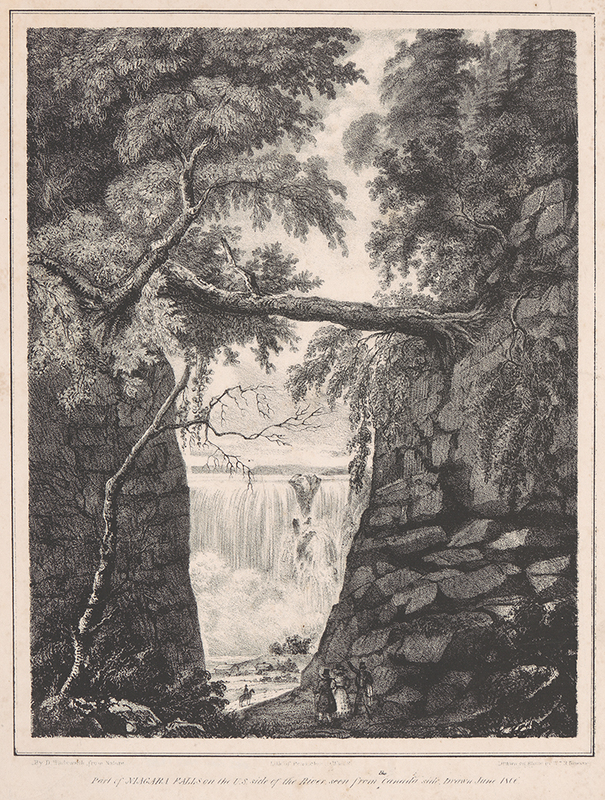 Related Works: After a drawing by Daniel Wadsworth, dated June 1806. Compare this impression with one at the Library of Congress: http://www.loc.gov/pictures/item/2003681602 . Part of the Niagara Falls on the U.S. Side of the River Seen from the Canada Side, . Lithograph on wove paper. Sheet: 320 x 256 mm (12.6 x 10.1 in.). DAC accession number 1985.3.1. Gift of Williams M. Mitchell (B.A. Wesleyan 1926), 1985. Open Access Image from the Davison Art Center, Wesleyan University (photo: T. Rodriguez). http://dac-collection.wesleyan.edu/obj3083 is a persistent link to this page with no user-session information.